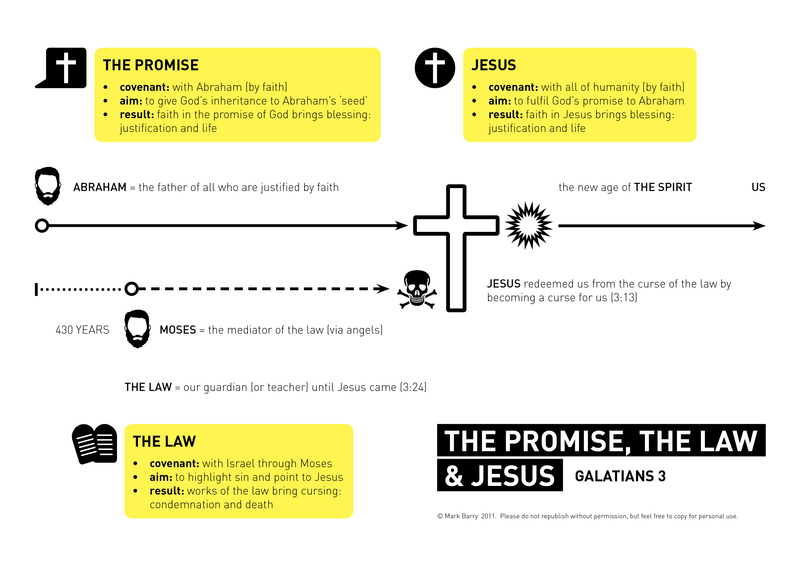 This entry was posted in English and tagged Galatians, New Testament, timeline. Bookmark the permalink. Thanks Tim and Doug for your suggestions. Good stuff. I’m preaching on Gal 3 in a while and had been visualising it in a similar. Your covenant aim result bits are very helpful. However, I wasn’t going to go for just a line for the time but a rectangle representing the covenant with Abraham, again with time along the horizontal axis. The cov with Moses was then going to fit within that rectangle as a smaller rectangle, but not touching the edges. The combination of the two covenants is, I think crucial to understanding the Bible. The problem with 1st C Judaism and the Judaisers was that they had made the Mosaic Cov bigger than the Abrahamic covenant, eclipsing it. In Galatians and Romans Paul is showing that the Mosaic Cov fits into the Abraham covenant and so was to be pursued by faith within the context of the Abrahamic Covenant, rather than by works (if you make the Mosaic Law primary). I guess what I am suggesting is that this can be more than a timeline, but also show how the mosaic cov fits within the Abrahamic as a school master inside the bigger picture. Very helpful, Nick. Yes – graphically that would make better sense of the relationship between the Abrahamic and Mosaic covenants. I’m really pushed for time at the moment, but hopefully in the near future, I’ll rework the diagram. Thanks!